3rd Edition - Updated and revised. 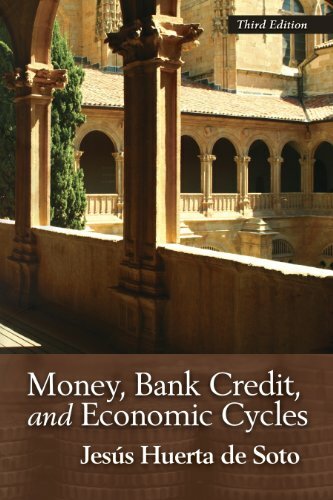 The three years since the publication of the previous English edition of Money, Bank Credit, and Economic Cycles have seen a continuation of the economic recession process set in motion after the 2007 financial crisis. This process has consisted of the inevitable microeconomic readjustment and realignment of a real productive structure which the credit expansion of the prior speculative bubble years had rendered unsustainable. Though governments fiscal and monetary policies have on many occasions been erratic and counterproductive, in the end, enormous growth in public deficits has brought on a sovereign public debt crisis in international markets. This crisis has been so severe that one by one, the different governments have been forced to take measures, even if timid ones, in the right direction, measures to reduce public spending, interventionism, and regulation of the economy, and to liberalize factor markets and make them more flexible, especially the labor market. Jesús Huerta de Soto, professor of economics at the Universidad Rey Juan Carlos, Madrid, has made history with this mammoth and exciting treatise. He integrates sweeping history and rigorous theory to make the good-as-gold case that the institutions of money and banking can be part of the free market -- without a central bank, without bailouts, without inflation, without business cycles, and without the economic instability that has characterized the age of government control. Those are the main points but, in fact, this only scratches the surface. Indeed, it would be difficult to overestimate the importance of this book. De Soto provides also a defense of the Austrian perspective on business cycles against every other theory, defends the 100% reserve perspective from the point of view of Roman and British law, takes on the most important objections to full reserve theory, and presents a full policy program for radical reform. De Soto has set new scholarly standards with this detailed discussion of monetary reform from an Austro-libertarian point of view. If you have any questions about this product by Brand: Ludwig von Mises Institute, contact us by completing and submitting the form below. If you are looking for a specif part number, please include it with your message.